In his new book Kill the Messengers, veteran Ottawa journalist Mark Bourrie details the all-controlling aspect of Prime Minister Stephen Harper’s government. In this excerpt, he assesses the Conservative crackdown on federal historians, researchers and librarians. 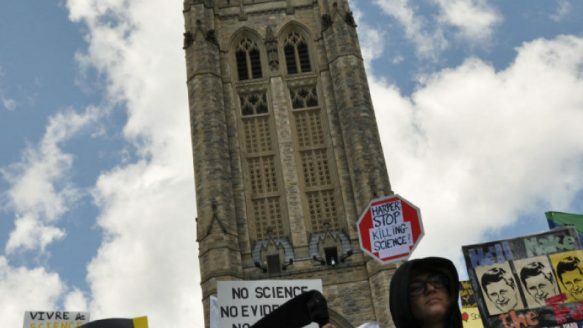 Scientists and academics gather on Parliament Hill on July 10, 2012 to protest Conservative budget cuts they say will undermine science in Canada and with it good policy based on evidence. Of all national assets, archives are the most precious. They are the gift of one generation to another and the extent of our care of them marks the extent of our civilization. Maybe the muzzling of climate scientists did pay off for Harper and Tories who didn’t want Canadians to spend too much time thinking about the climate: from 2007 to 2012, the volume of media coverage of climate change issues fell by 80 per cent. When the Harper government held closed-door meetings to talk about ways to cut Environment Canada’s budget by $60 million in the 2012 federal budget, Harper’s team made sure communications specialists were in the room. Records labelled “secret advice to the minister” were part of 500 pages of briefing material prepared for a new deputy minister when she arrived at Environment Canada a few months after the meetings. “Strategists from the communication branch were involved in Environment Canada’s deliberations on its contribution to the deficit action reduction plan from the beginning,” said the records, released through Access to Information. They also showed that Environment Canada’s human resources branch managers stayed in touch with both the Prime Minister’s Office and the Privy Council Office. The Harper government is especially sensitive about any scientific research that shows the extraction of oil from the bitumen sands of northern Alberta is a threat to the environment or to people. Environment Canada researchers Derek Muir and Jane Kirk agreed with findings by University of Alberta scientists Erin Kelly and David Schindler that contaminants are accumulating in snow near the oilsands quarries. While the university scientists could discuss their findings with the media, the government scientists could not. By the sixth year of the Harper regime, most scientists knew it was foolish and dangerous to try to buck the system. The Index on Censorship took a survey of 4,000 Canadian scientists in 2013. Only 14 per cent said they felt they would be able to share a concern about public health and safety, or a threat to the environment, without fear of retaliation or censure from their department or agency. Once the Harper government had scientists under its control, it went after their research libraries. First, Health Canada turned over its interlibrary loan system to a company called Infotrieve. Every time a researcher wanted material from a scientific journal article, a book from a university library or a publication from a federal or provincial agency, Infotrieve billed the scientist’s department. To save money and aggravation, some research scientists started borrowing university library cards from co-op students and friends who taught in universities so they could get the interlibrary loan material for free. Others had to ask friends working for private companies to get government-owned research material for them. Scientists like Mueller were not just kept away from books. They were also unable to get help from trained science librarians who know how to track down publications that are obscure, rare or hard to get. Health Canada had 40 of these librarians. In April 2013, it had six. “A librarian is far better at doing a literature search than I am,” Mueller said. “It’s their profession.” Mueller said the research support system had become absurd and, by the end of his career with Health Canada, he believed he wasn’t able to do his work properly. At least one Health Canada scientist started his own library, squirrelling away 250 feet of shelf space worth of books and journals in his basement. Friends who work for the department email him with requests, and the scientist tracks the material down and brings it to work. If the plan was designed to save money, it’s been a failure. Health Canada Library Services had a staff of 36 and a budget of $1.75 million in 2008–2009. In 2013–2014 there was a staff of six and the cost had risen to $2.67 million. On top of that, each time a Health Canada scientist needs a document, the department has to pay a $25.65 retrieval fee plus the courier bill from the National Science Library. Scientists are charged $9 for a scanned, emailed document. Former Green Party activist Katie Gibbs, who holds a PhD in biology specializing in conservation science, organized the Death of Evidence marches in 2012. She believes the Harper government doesn’t want to hear from scientists, even those who work in the federal bureaucracy. “I think there are multiple ways to avoid using scientific evidence in policy development. One way is to not collect it and get rid of historical documentary information,” Gibbs said. “A picture does say a thousand words. You see pictures of dumpsters full of books. It’s alarming. You see lots of examples of private companies picking up these books. I’ve heard from so many scientists who took the material home because they couldn’t stand to see this material thrown out. Scientists are sending out emails to each other saying what they have stored away. It’s having an impact on the ability of scientists to do their job,” she said. Historians have faced the same kind of cuts. In Harper’s Canada, history comes from the Centre, not from the work of the professors and authors who depend on easy access to the vast collection of documents and pictures at Library and Archives Canada (LAC). Inside its Ottawa building, just a block from Parliament Hill, services have been slashed, employee morale is dismal and visiting scholars are angry. The words “dusty” and “archives” are usually used in the same breath by people who don’t understand that history is a living thing that can, and often is, remade to suit political agendas. History is also often hidden by governments that want to write their own narrative of what a country’s about. The archives is so poor that it’s missed out on important historical letters, a collection of narratives from fugitive slaves in Upper Canada from 1856, and letters from British colonial officials on the state of First Nations in eastern Canada during pioneer times. In 2008–2009, Library and Archives Canada spent $385,461 on historic documents. In 2011–2012 it spent nothing. In Washington, the Library of Congress’s acquisition budget was between $18 million and $19 million annually from 2009 to 2012. In the early years of this century, Library and Archives Canada started working on a project to make its collection accessible to everyone. First, Prime Minister William Lyon Mackenzie King’s diary and documents from New France were posted on the Internet. Probably the department’s heart was in the right place, but the plan has been a failure. Six years into the digitalization project, there was very little to show for it except frustration, with LAC staff and managers unable to get the system running properly and Canadians finding it not very helpful. When people have asked for material that is politically sensitive, Library and Archives Canada, prompted by its overseers in the Heritage Ministry and the Prime Minister’s Office, has dug in its heels. Since 2005, Canadian Press reporter Jim Bronskill has been trying to see the RCMP security service file on one-time federal NDP leader and Saskatchewan premier Tommy Douglas, who died in 1986. The file is 1,149 pages thick, but Bronskill received just 400 heavily censored pages when he filed his first request. Library and Archives Canada released another 300 pages of the file just before Bronskill’s case was heard by the Federal Court, and Bronskill got some more of the file after the court ruled in his favour. The material that has been released shows the country’s national police force tailed a mainstream elected politician for almost 60 years and watched him long after he retired to see if he was involved with communists, members of the peace movement or anyone else identified by the police as a danger to the state. The federal government outsourced some of the archives’ work to ancestry.ca, a for-profit website used by genealogists. People can go to the archives building and use this service without paying, but if they to want use census material from the comfort of their home, they’d better have their credit card handy. To do the job right, a national archives still needs archivists — many of them skilled historians — to help professional and amateur researchers who come to Ottawa to use the collection. But rather than increase Library and Archives Canada’s budget so it can do its job, the Harper government has cut it. It may scold Canadians and immigrants for not knowing their history, but it has made it much harder for people to study and write about the past. Along with preventing the archives from adding to the nation’s collection, cuts have manifested themselves in reduced hours, slower service, lack of access to important documents, and slashing of staff. The ones who still have their jobs often seem overwhelmed and overworked. In May 2012, more than 200 people, many of them experts with unique skills and years of experience, lost their jobs. People who arranged for loans of material in the collection, specialists who preserved microfilm, digital experts and reference librarians were tossed out. Training was cut. Half the LAC circulation staff who dealt with analog material — what the rest of us call books and documents — were fired. The library also killed its interlibrary loan program. In its last year in the interlibrary loan system, the national library lent 20,000 books to people across the country, often in isolated communities. Morale among the surviving staff, which was never very good, has tanked. Rather than deal with the lousy work environment, Daniel Caron, the former head of Library and Archives Canada, simply gagged his employees. He was trained as an economist, not a librarian or archivist, and his tenure saw a rapid deterioration in services and morale. Like other managers in the Harper government, Caron wanted to put the screws to employees who might gripe to the public. That chattiness came to an abrupt end in May 2013, after Caron was called into Heritage Minister James Moore’s office to explain why Library and Archives Canada’s leader billed the government nearly $4,500 for Spanish lessons. Soon afterwards, the New Democrats released a document outlining what the party’s heritage critic, Pierre Nantel, called Caron’s “titanic expenses.” The publicly available figures show Caron filed $87,000 in expense claims in each of 2011 and 2012. Moore’s own expenses were about $46,000 in each of those years. Caron submitted expenses for business lunches in Ottawa’s best restaurants and the private Rideau Club, and for rooms in expensive hotels in Quebec City and Puerto Rico, along with trips to Toronto, Europe and Australia. Suddenly, Caron was out of a job. Just a month after Caron left, the archives finally opened its wallet to buy some Canadiana. It was obvious Library and Archives Canada had learned a lesson on how to serve its masters in the Prime Minister’s Office. Library and Archives Canada chipped in with the Canadian Museum of Civilization (now the Canadian Museum of History) to spend almost $700,000 on a collection of documents and artifacts belonging to Sir John Coape Sherbrooke. It fit with the War of 1812 fetish. The collection was described as “the largest and most complete collection of War of 1812 documentation ever” in the government’s announcement, which was made by Heritage Minister Moore. Library and Archives Canada would carry on, at least for War of 1812 buffs, but its staff would continue to tread very, very carefully. Excerpted from Kill the Messengers: Stephen Harper’s Assault on Your Right to Know © 2014 by Mark Bourrie. Published with permission of HarperCollins Publishers Ltd. Kill the Messengers will be in bookstores by Jan. 27.